Royal Blood is a play for the living. This world premiere from playwright Sonya Schneider, directed by Laurel Pilar Garcia hits every note as humor comes in the form of human truth, and the heavy drama of a broken family sits squarely on the heart. Funerary from the start the play centers around three deaths: Mom has died a few years back, and her distant relation to Lady Diana still haunts the family as they come to grips with the difference between living in the past and living for the future; brother Leo’s suicide is the catalyst for this broken family to reconnect; and the family dog, also named Lady Di, is being buried in the back yard. 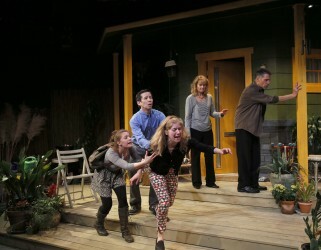 The back yard itself has been constructed flawlessly (Jennifer Zeyl, design) as the black box theater that is West of Lenin is transformed into a porch and patio complete with a bug zapper, croquet set, and swing. Cheerful Deb (Amy Love) bursts into the yard dancing gleefully to water the plants, and though the chirping birds come on strong, it is not to be a cheerful play. Deb begins digging a grave. Amy Love plays the spectrum well. In her honest portrayal of this disabled character she never loses her footing in the naivety of a grown woman stuck in her childish brain. Contrasting nutty Deb, is big sister Dorothy (Mari Nelson). Responsible Dorothy is the rock of the family, but like any rock in a crumbling world, the rock must break. It is the building momentum of the disintegrating rock that is the arc of this beautifully written drama, and Nelson delivers the goods as her icy exterior slowly melts. The patriarch of the family, Cliff, is expertly played by Seattle fixture Todd Jefferson Moore. It is difficult to despise the charming Moore, and he helps us love this decrepit old man, whose values and attitude are sorely lacking grace, but Moore is adorable somehow behind the cruelty, as he administers humanity, and forces the audience to empathize with his soulful performance. Garcia directed this new play with a deft hand. The chemistry between the actors, the fullness of the scenery, the design of the lights (Evan Anderson) that move from night to day, and the sound/music (Robertson Witmer) all work together in seamless transitions as Schneider’s themes of living with connection, appreciating the stars, and dealing with the truth, are all brought to life. Nicole Merat as the young Cassiopeia also delivers a fine performance, as the sixteen year old acts as the voice of reason to this dysfunctional, crumbling family struggling to find something to live for. David Hsieh delivers as well as the outsider who wants to mourn the death of Leo, but is put out as he roams the perimeter looking for a way in, and his frustrated exits punctuate an already complicated scenario. If all of this is not convincing enough, come see this play for the costumes (Anastasia Armes). Cassiopeia’s boots alone are worth the cost of admittance, and eccentric Deb with her throwback fashion sense that comes from her love of old movies will delight. The world premiere of Royal Blood is a must see for anyone who loves theater. It is refreshing to know the art of playwriting is alive and well in the hands of Sonya Schneider.